was actually the first day I got my boat out all year, which has to be some kind of record for me. Not a good record to break at all. Also, some home obligations didn’t allow me to get down to La Crosse and on the water until 11am. The Mississippi River near La Crosse is a vast sprawling body of to begin with, but to complicate matters more the water was over flood stage and rising for my practice and through the tournament. I had actually never been on this pool with the water this high. well known grass flats with a lipless crankbait that results in a few bites and a handful of chunky northern pike, time to move on. figuring that with fluctuating water the fish could easily adapt, only produced more northerns and a few short largies. My next stop was the closing dam that produced most of my fish last year. My first few casts with produced nothing, but I didn’t feel like I was getting bit, so I up-sized my mojo weight to a 1/4oz tungsten weight and instantly caught a chunky prespawn smallmouth. I got bit on the next few casts, which included 3.5lb class fish. I then picked up a DT6 to see if they would hit a reaction bait, my first cast over the sweet spot yielded a double. 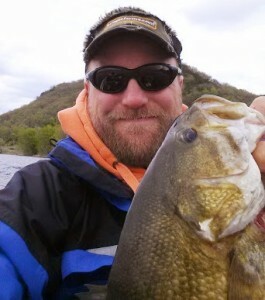 It was another big smallies with a keeper hanging on for dear life until shaking loose next to the boat. This was actually my first every double for bass. Rather than cast anymore there, it was time to find more fish and more water areas in the same section of the river. duplicate this smallsmouth spot and checking for largemouth getting ready to move up. I ended up catching two more keeper largemouth on a MJ rig or Power Spinner rig, depending on what you call them. The 2nd fish was a good quality fish and was at the mouth of a likely spawning pocket that had what looked to be the makings of a good area if the weather warmed at all. of water new and old to scratch out 3 measly keepers, 2 on a jerkbait and on the MJ rig. I called my practice a little early to get up to La Crosse for an interview with the local NBC news affiliate, embedded below was the result. My feeling going into the tournament is that if that school of smallies held up I could have another Top 10 finish, if they didn’t, I knew it would be a grind just to get a limit. little nervous about getting on my fish, but also the late check-in time could be well worth it with the sunny warm day that was forecasted. My co-angler was a local, who agreed that fishing had been pretty tough for him as well. Take off and getting down to my fish went as smooth as one could hope. It only took a few casts with my mojo rig to connect with a keeper smallie. Not the fish I was hoping for, but showed me fish were here and in the past this spot has mixed sizes of fish. By 8am I had my limit of smallies, but most of them small and my co-angler had 3 smallies, but he got two bites in the 3lb class. We both missed and lost what felt like good fish early. It kind of felt like some fish had left this spot, so I tried bouncing around the area to fish areas where I thought they were headed and then I would return to this area hoping they would get a rest and be ready to bite again. It worked once for a nice cull, but it just wasn’t producing enough bites or the size. one hour of fishing time left, I decided to go back to the current area. Honestly, I think I could have gotten another bite or two in the largemouth area, but I felt my best chance for a big bag was to go back to see if that school had reposition or fired up. 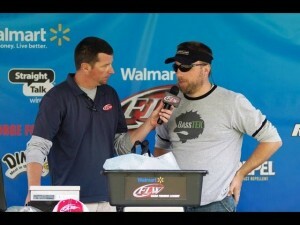 Since I am not fishing all the BFLs this year, points didn’t really matter and I wanted to shoot for a good payday. I ended up catching a short, a catfish and a walleye in the last hour. one spot out of the money by 2oz. Kudos to my co-angler Josh, catching those two nice smallies propelled his limit to 11lbs and a 4th place finish on the non-boater side. Honestly I think I had a decent game plan, if I had gotten the right bites I could have had a nice check, but maybe I overestimated the quality of the school or not recognized they were leaving and put too much time into it during the tournament, but that is fishing and it’s all about decisions. For those that don’t like to read, feel to watch the video summary below and I also have some GoPro fish catches from practice and tournament morning.